The ArcGIS Book, new from Esri, outlines 10 big web mapping ideas and how to put them into action using the ArcGIS platform. The website includes accompanying Learn ArcGIS lessons, videos, and other supporting materials. 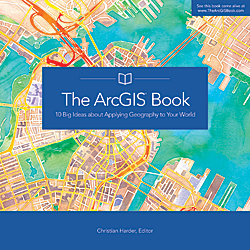 Edited by Christian Harder of Esri, The ArcGIS Book was written for a diverse audience, including GIS professionals just venturing into the new world of web GIS as well as web technologists, information workers, web designers, and others who increasingly recognize how maps play a pivotal role today in clearly communicating information. The book also serves as a perfect introduction to web GIS for managers and executives interested in understanding how maps can help them make sound business decisions for their organizations. In an interactive and interesting way, the book takes readers on a journey on how to create and share GIS web maps, use new smart mapping capabilities in ArcGIS to make beautiful and well-designed maps, do spatial analysis online, make 3D web scenes, and work with mobile GIS. A print version of The ArcGIS Book is available for $19.99. You also can download a free PDF [70 MB] of the book from TheArcGISBook.com.